March 27th, 2017 | Children & Pets, Moving Tips. If you’re moving to a new climate, you will probably research tips to help your family adjust to the new weather. But what about your cat? Differences in the weather at your new home can have a big effect on her health and happiness, especially if you have a young or disabled feline. In this blog, we will discuss ways to help your cat adjust to a new climate, hot or cold. First things first, whether you move somewhere hotter or somewhere colder than your previous home, find a vet. When an emergency happens, you don’t want to have to take the time to find a good vet. 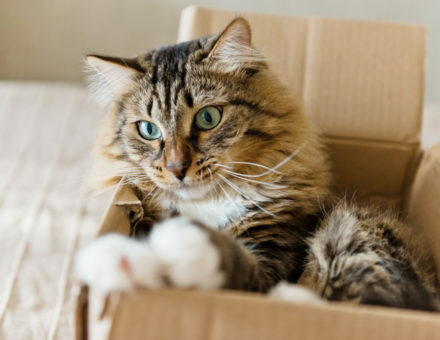 Be prepared, and get your cat established with a vet immediately after your move. Diet plays an important role in body temperature regulation. When moving to a cold climate, make diet changes to help your kitty stay warm. Provide her with a diet rich in protein. Increase her portion size a little as well to help your cat stock up on fat. In warm climates, fresh and cool water represents your top priority. Put a few ice cubes in her water tray and look into purchasing a water fountain, which keeps the water from stagnating. You can also make “Catsicles” by freezing wet food or dry food mixed with water as a nice, cold treat. You may think that you don’t have to do as much grooming for your cat if you move somewhere cold, but you still need to look out for matted fur, which allows cold to get to her more easily. Depending on the breed of your pet, you may also want to look into buying (or even making) your kitty a warm sweater. In the heat, brush your cat regularly to help her get rid of excess fur. This also has the added benefit of helping to prevent hairballs, which can increase in the stress of a move. Your kitty always needs a good place to rest, no matter what the weather is like. If you go somewhere cold, try to keep your cat’s bed off the floor, since warm air rises. If she doesn’t sleep in your bed, look into buying her a heated bed. In the heat, you may want to open a few windows to let in a breeze. This is especially helpful if your cat likes to sit and watch things from the window anyway. Before making the window available, check to make sure the screen in the window frame is secure to reduce the risk of accidents. Also allow your cat to lounge on cool tile floors or darker areas of the house. If your cat spends time outside on a regular basis, it’s even more important to take extra care that she stays healthy. In cold climates, either construct or purchase a shelter that stays outside in case your cat gets locked outside for a long period of time. Provide an insulated and comfortable shelter in order to prevent hypothermia and frostbite. For hot and humid areas, it may also be beneficial to purchase a cheap water mister to keep your cat cool. Carefully manage any water and food that stays outside. You don’t want them to freeze in cold climates, and you don’t want them to get stale or rotten in hot climates. If you notice any lethargy or unusual behavior in your cat following a big transition, take her to the vet immediately. Start preparing for these changes well before the move, so your cat adjusts more gradually and smoothly. Contact us at Wheaton World Wide Moving for more information.